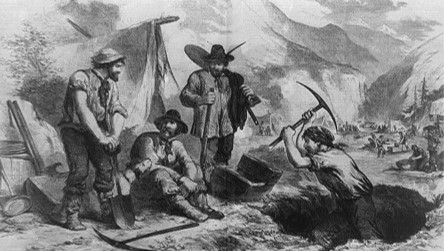 Bessell joined the adventure in California searching for gold and stayed over 10 years. PART 8: FREDERICK BESSELL’S LATER LIFE– AS A SETTLER ON THE FRONTIER, 1849 GOLD MINER AND A CIVIL WAR VETERAN. So we know that Frederick Bessel was in Salem during the time of the White murder in 1830. What happened to him after that? Well it’s a really interesting story. The story of his later life can be found in “The History of Schuyler County,” in Illinois. It appears that like many Americans, he went West so he could reinvent himself, far from Salem. And it also appears that his love for adventure continued on in his later life. “With such means as he had been able to save from his earnings, Frederick L.A. Bessell started for the Middle West in 1833, coming direct to Schuyler County, Ill., and after his marriage during the following 34, Brooklyn, Township, which he at once began to improve and in the home which he established in the wilderness all of his children were born. In 1848, he purchased property in Brooklyn, whither he removed with his family the following year. Coincident with this removal came the news of the finding of gold in California, and among those who left Brooklyn for the far West was Mr. Bessell, who made his way overland with ox teams. It was not until about 1860 that he returned to his Illinois home, but fate did not permit him to remain there long, for the drums of war soon sounded and all able-bodied men were called to the defense of the country. Mr. Bessell attempted to enlist from his home town but as the quota was then filled he went to Macon City, Mo., and enlisted in the Seventh Missouri Infantry. His service was brief, however, for he was soon taken with measles from the effects of which he died December 24, 1861.” His wife lived until 1900. Frederick Bessel had six sons with his wife Jane between 1835 and 1848. So there you have an end to the mystery of Frederick Bessell and his life before and after he set up camp in Windham. He came to America from Sumatra and was on one of the first American ships to open trade with Viet Nam. Then he went on to hold camp with Major Dudley in Windham, NH., and as a result of excessive spending on credit, was forced to declare bankruptcy. He arose from the ashes and moved to Illinois, where he married and had six sons. Then ever the adventurer, when he heard about the California gold rush, he left his family behind in search of fame and fortune. After spending 12 years in California, he returned to Illinois, and at 57+/- years of age, volunteers to enlist in the Union Army during the Civil War. Quite a story, quite a life!